The Georgetown Tobacco Caucus is only available at Georgetown Tobacco, and was blended in 2009 when David Berkebile visited Rocky Patel’s factory in Danli, Honduras. The blend was designed to complement the flavor of the Ecuadoran Sumatra wrapper leaf, which is David’s favorite. The result is a rich and satisfying smoke that avoids the extremes of strength and taste which have become common in today’s cigar market. 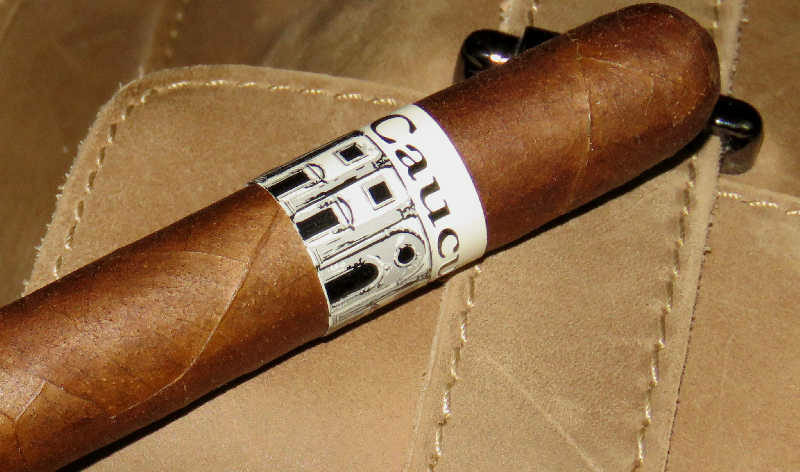 The medium body and subtle flavor make the Caucus accessible to a wide variety of cigar enthusiasts, who have made this the most popular brand in our store. Provided to us by Cigar Man for Life, these sticks have been with us for a while and are a few that we both enjoy. Probably the best cigar I’ve had produced by Rocky Patel since the RP 15th Anniversary in 2010. Tonight’s cigar is 6” x 52 and sells for about $7. Over the past couple weeks, a few large scale acquisitions have come to pass in the tobacco world. The one of most interest to cigar folks is Altria (parent of Philip Morris) picking up Nat Sherman. While most of listeners of this show know Nat Sherman as a cigar company, cigarette production is a major component of their business – but they do hold a number of premium brands. Future plans for these premium cigar brands (made for them by Plasencia and Quesada) are yet to be announced. Dunhill cigars and pipe tobacco….gone, or will be soon. It’s THAT time of year again. Manufacturers are beginning to announce the “if/when” of price increases. So far, I’ve seen bits coming down from Perdomo, AJ Fernandez, and JC Newman…but personally I expect there to be many more over the next 4-6 weeks. Terry Johnson (TL Johnson Cigars) has merged with Black Patch Cigars of Kentucky. To my recollection, we’ve only talked once in memory about Black Patch and the “Kenbano” tobacco they grow in Kentucky to showcase in their blends. Tabacalera TLJ will produce Black Patch cigars going forward, and presumably the Kenbano will be coming down for those purposes. Since our last show, Matt Booth has announced he’s retiring from the cigar industry – along with his Room101 brands, which he owns. His attention will turn to focus on his lucrative jewelry business. His contract with Oettinger Davidoff expired Jan 1st, and he has opted not to renew. It’s still possible that the brands could return to production, but no plans have been announced at the moment. The IPCPR tradeshow was somewhat “booted” from the former venue, the Sands/Venetian complex. It’s been widely speculated that a bigger group wanted the venue for the assigned dates, and with the convention hall holding the power to cancel, they opted to do so. IPCPR has quickly adjusted and rescheduled for July 10-14 at the Las Vegas Convention Center. The move de-couples hotel arrangements from the convention site, but presumably won’t offer much more interference except being a bit off the strip. So, the FDA has extended the deadline for manufacturers to submit ingredient lists for cigars from Feb 15 until Aug 8, 2017. That’s the news from the FDA, but after looking over the requirements I can’t help but wonder about a couple things. First, for any premium cigar made with no chemicals besides potable water and tobacco, there are only 4 requested pieces of information: tobacco type, variety, curing method, and any recombinant DNA technology used in creating the varietal. Even for these cigars – containing nothing aside from water and tobacco – I have questions. First, the “type” of tobacco must be listed by weight. Exactly how much does ½ leaf – cut by human hands from variably sized leaves – weigh? I wonder with what precision the FDA expects this to be? Secondly, I wonder how many manufacturers *truly* know how the tobacco they used has been genetically engineered? I’ve spoken with some in the past who simply don’t. They buy tobacco. They know where it was grown, who grew it, and many other details – but they may not know it intimately on an agronomical basis. I also wonder – for those who use something other than water – if they know enough detail about their process to accurately submit the application. Bethune, the “secret sauce” used by more makers than would admit, often contains wine, rum, tobacco, water…and various other ingredients passed along sparingly like it’s the Colonel’s original recipe. I am willing to bet many can’t answer the questions regarding chemical reactions and other properties imbued by the Bethune. I have no idea how stringently this will be enforced, nor even if it can be without FDA personnel on the ground in factories throughout cigar country (a la food inspectors). I’m anxious to see how third-party cigar companies meet this; I have a gut feeling many don’t know their cigars on a level to complete this and will have to rely on information from their partner manufacturers (and/or agronomists from *their* sources). Small manufacturers (under $5million/yr) will have an additional 6 months to comply, so we’ll see in a year or so…. Fuente Fuente Opus X 20th Anniversary pre-release from CFC. Quesada Keg – both Nicaraguan and Dominican versions. 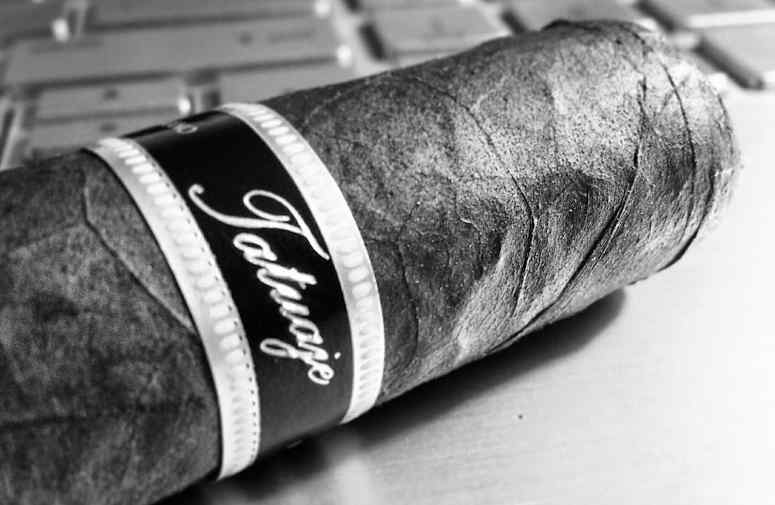 Re-released for the Tatuaje 10th Anniversary in 2013 (after a limited 2007 initial release), the Tatuaje Black Corona Gorda is one of my favorite Tatuaje blends of all time. They’re rolled by My Father, and feature a Sungrown Criollo Estelian wrapper over Nicaraguan binder and filler blend. It comes in at the typical 5 5/8” x 46 and retails somewhere around the $10 mark, depending on retailer. El Niño is wreaking havoc with Cuba’s tobacco crop…what are the lasting effects after 3-4 consecutive years of weather troubles? This news came out a couple weeks ago, but I don’t believe we talked about it. Chicago has a new proposed tax increase on cigars…to the tune of $.90 per cigar! According to some estimates, it will add upwards of $2 to the completed retail pricing of some cigars. The proposal asks for the tax to finance transition classes for incoming high school students. 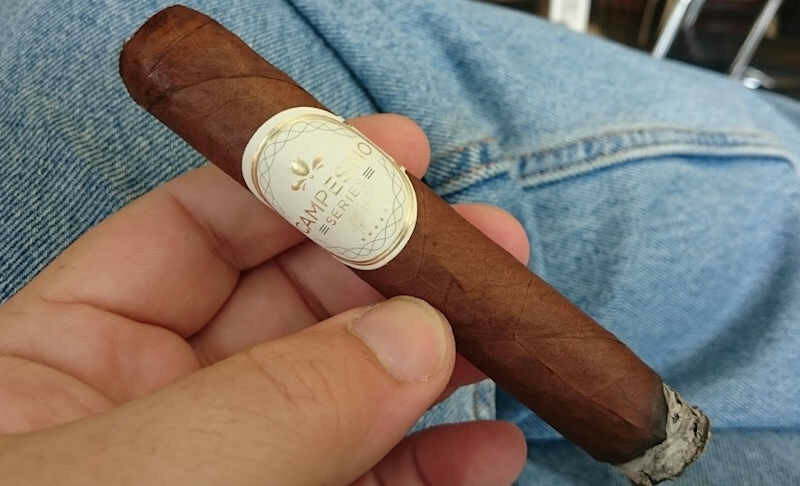 I smoked a couple of new upcoming blends from TL Johnson this week…including the Counsellor, a prototype cigar for a retailer, and a blend slated for this year’s IPCPR which he’s not yet ready to talk much about…. PSA: It’s that time of year to stock up before the annual price increases for many brands….I know Altadis (to be fair, some of theirs are decreasing), Fuente, CLE, AKA all have planned increases come February-ish. Halfwheel is reporting the formation of a new distribution company – White Hat Tobacco – by former Cubanacan employee Spence Drake. The company will distribute Hirochi Robaina’s cigar(s). 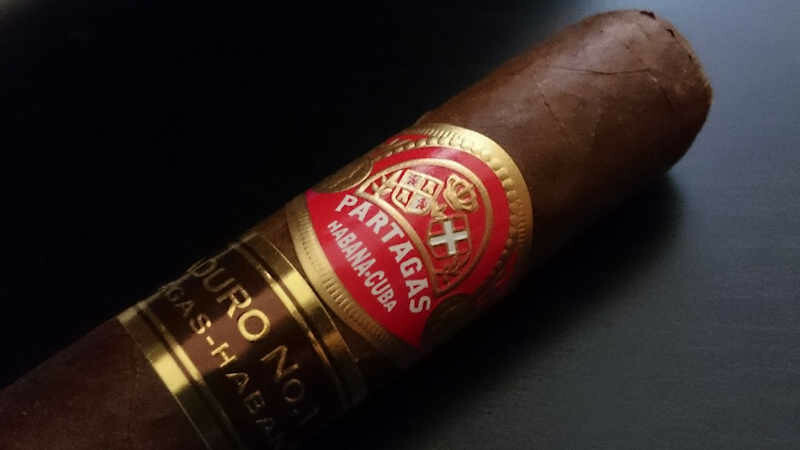 The expected launch is due in March, with coverage of the existing HR Habano. Two additional lines, as yet unnamed publicly, will launch at IPCPR 2016. Both of those lines will come in significantly less expensive than the HR Habano. Diana Silvius of Up Down Tobacco has passed away as of last Saturday night. Our condolences to the family. La Aroma de Cuba Mi Amor Torpedo – This cigar was self infused. I was given it at Christmas and forgot about it in my truck for a few days. WHen I came back to it, the cigar desperately needed humidification. I put it in an old tubo with a dab of the only water I had; coffee. I closed the top, left it sit for a few weeks and it was… spectacular. TL Johnson: Counsellor, something for a retailer (possibly), and something in the works for IPCPR 2016…. In the next episode (138), we will be smoking the Hirochi Robaina HR Habano. So come by Friday night and hang out with us in the chatroom during the show. If you would like to contact us in the meantime, you can reach us via the Contact Page or the following emails: [email protected] or [email protected] Please feel free to drop us a line if you have any questions you’d like answered, comments to make…or even compliments and complaints. We love to get your emails! Also, remember you can always go back and listen to previous episodes, which can be found in the Half Ashed Archive. You can download this week’s audio directly below (right-click “Download” and save), find us on iTunes, or subscribe with any podcast app at our RSS Feed. Video, as always, will be available at the Half Ashed YouTube Channel. Sam Leccia departs from General….despite originally being described as an “acquisition” by General of the Leccia blends in 2014, Sam apparently still holds his own trademarks and branding. He is leaving both the distribution arrangement and his position within Foundry and striking out on his own again. Pete Johnson has shown off a picture of this upcoming year’s Tatuaje Monster release – the Kreuger, named after Freddy Kreuger of Nightmare on Elm Street fame. Specifics for blend and exact size haven’t been revealed, but it’s a large, pressed torpedo shape. House of Emilio has rebranded itself as Boutiques United. The company unveiled its new website and branding, showcasing the four remaining marques they distribute – Ezra Zion, Emilio, Global Premium Cigars (1502), and Nomad. Sales force and distribution arrangements reportedly remain the same. Our friend Terry Johnson is *finally* getting Counsellor Cigars to market. The line was originally to be a joint effort between TLJ and LTC, but was held up when the two parted ways last Summer. It’s a revival of an old, long out of use trademark that Johnson picked up quite some time ago. It will feature a Mexican San Andres wrapper, Dominican criollo ‘98 binder and a corojo/criollo filler blend. Counsellor is slated to ship next month in five vitolas, boxes of 10, and will retail between $5.50 and $6.50 per cigar. 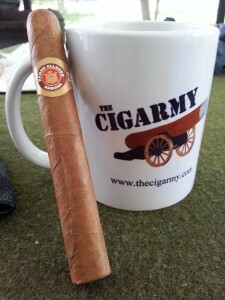 I smoked a couple of these a few months ago, with spectacular results…. Since we touched on La Tradicion Cubana, Luis has announced a price *decrease* on all his products across the board. He’ll be trimming his pricing by about 10% on most all his lines. Good news, indeed! In the next episode (137), we will be smoking the Tatuaje Black Corona Gorda. So come by Friday night and hang out with us in the chatroom during the show. If you would like to contact us in the meantime, you can reach us via the Contact Page or the following emails: [email protected] or [email protected] Please feel free to drop us a line if you have any questions you’d like answered, comments to make…or even compliments and complaints. We love to get your emails! Also, remember you can always go back and listen to previous episodes, which can be found in the Half Ashed Archive. You can download this week’s audio directly below (right-click “Download” and save), find us on iTunes, or subscribe with any podcast app at our RSS Feed. Video, as always, will be available at the Half Ashed YouTube Channel. A traditional 6.5″ x 42 Lonsdale vitola with a slightly green tinged claro wrapper and a simple triple cap. The wrapper appears “dry” and mildly toothy. TL Johnson and La Tradicion Cubana have – from all outward appearances – parted ways amicably. This was announced by posts to both companies’ social media accounts. TL Johnson will additionally be opening a factory in the Dominican Republic to manufacture their own cigars and the Counsellor line that was announced this past year. They will also be providing manufacturing capacity for custom cigar production as the need arises. Casa Fernandez and relative newcomer Warped have announced a new cigar to be released at this year’s IPCPR. The Futuro is being promoted as something “different” from what the two companies might normally offer…although with a Nicaraguan puro using most or all criollo and corojo from the late 90’s I’m not sure how much of a departure this will actually be for Casa Fernandez. I love AGANORSA, but it’s not exactly the most diverse profile in tobaccodom. It will be available in 2 vitolas – a 6×52 Futuro Seleccion 109 and Seleccion Suprema (5-⅝”x46). 400 boxes of 20 for each vitola will be made available at the show, with future production possible as well. The numbers are in. The Cigar Association of America’s annual report (via Cigar Aficionado) for cigar importation into the US shows a pretty flat year in 2014. Both Dominican and Nicaraguan imports dropped, with a slightly larger Dominican reduction…but neither are significant. What’s interesting is the slowed import flattening for Nicaragua. You may remember a mere two years ago that Nicaragua was poised – at its then-current rate – to overtake the DR within a couple years. They’re holding strong at second place, only separated by a few million sticks…but the growth has stalled for the past year. The L’Atelier Cote D’Or has begun shipping. It debuted to a soft launch a few months ago, but has begun showing up nationwide now. It’s a 7×47 soft pressed churchill (the only vitola), and has a production run of 2100 boxes of 10. It uses the Ecuadoran Sancti Spiritus wrapper (Same as the Seleccion Speciale from L’Atelier), over Nicaraguan internals. I picked up a few of these this week, and we’ll feature it soon on the show. It’s a bit of a step out for L’Atelier with its $15-ish price tag, as most of their lines fall in the typical “sweetspot” we so often talk about. Erik Espinosa will be relaunching the Murcielago blend. Originally, this was an EO Brands line, produced by My Father. Through all the splits, Espinosa retained the rights to the name, and says he thinks he has reverse engineering the blend to be the original. 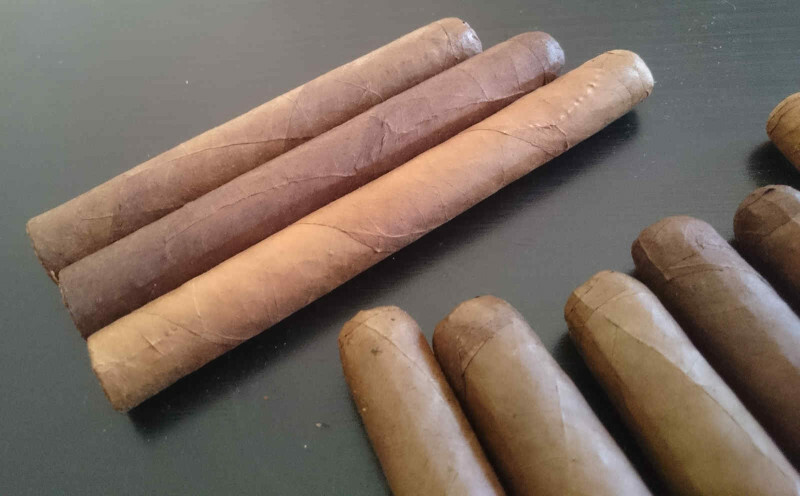 The only blend details are a Mexican San Andres wrapper over Nicaraguan binder and fillers. Pricing has not yet been announced…and I’m more than a little piqued at how this blend will be and how it will compare to the original….since it was made by My Father at a time when they used AGANORSA tobacco. I’d like to know the details of how they have reconstructed it. Who knows? Maybe it’ll be a dead match. It just seems bold to declare an exact match. Asylum Insidious – Ec CT over Honduran fillers; made at CLE’s El Aladino factory. Might not have tried this one had I known its makeup…but I’m glad I did. The sweetness provided a nice surprise, with only some bitter notes toward the very end. With a 6”x52 going for about $4, it’s a win in my book. I’d not resist having a few around, but it wouldn’t be a frequently smoked stick for me. On Dale’s recommendation, I gave the Camacho Triple Maduro another try. Why do I keep doing that?!? Tight draw, wonky burn – which, in unison, created a weird “solvent” kind of flavor I didn’t care for. Made it about ⅓ of the way through the robusto. Still not my cup o’ tea…although it once was. In the next episode (115), we will have special guest Bob McDuffee. Kip and Bob will be smoking the Ashton Symmetry. So come by Friday night and hang out with us in the chatroom during the show. If you would like to contact us in the meantime, you can reach us via the Contact Page or the following emails: [email protected] or [email protected] Please feel free to drop us a line if you have any questions you’d like answered, comments to make…or even compliments and complaints. We love to get your emails! Also, remember you can always go back and listen to previous episodes, which can be found in the Half Ashed Archive. You can download this week’s audio directly below (right-click “Download” and save), find us on iTunes, or subscribe with any podcast app at our RSS Feed. Video, as always, will be available at the Half Ashed YouTube Channel. P.S. – If you have unbanded suggestions or contributions, you can get those to us by sending an email to [email protected] This email address goes directly to my wife, so you can simply suggest an unbanded cigar for her to source, or [email protected] if you have something you’d like to send in. I will provide an address to send them. Thanks! T.L. Johnson Cigars is no longer part of the Cuban Tradition Cigar Group. We have decided to part ways with the Cuban Tradition Cigar Group and open our own factory in the Dominican Republic. We will be rolling all T.L. Johnson Cigars as well as Counsellor Cigars and will be taking on producing private label cigars as well. We are exciting about our new endeavor and producing the best quality cigars as you have come to expect from T.L. Johnson Cigars. After 3 -years working with Tabacalera LTC in Dominican Republic and La Tradicion Cubana in Miami and being part of The Cuban Tradition Cigar Group., TL Johnson Cigars has decided to branch out and open its own cigar factory. We at Tabacalera LTC, La Tradicion Cubana and The Cuban Tradition Cigar Group are happy that as a result of the great product we produced for TL Johnson Cigars, and the market exposure we provided, they are now able to go out on their own. Just like a parent is proud and wishes only the best for their child, so we at Tabacalera LTC, La Tradicion Cubana and The Cuban Tradition Cigar Group wish TL Johnson Cigars ‘long ashes’. 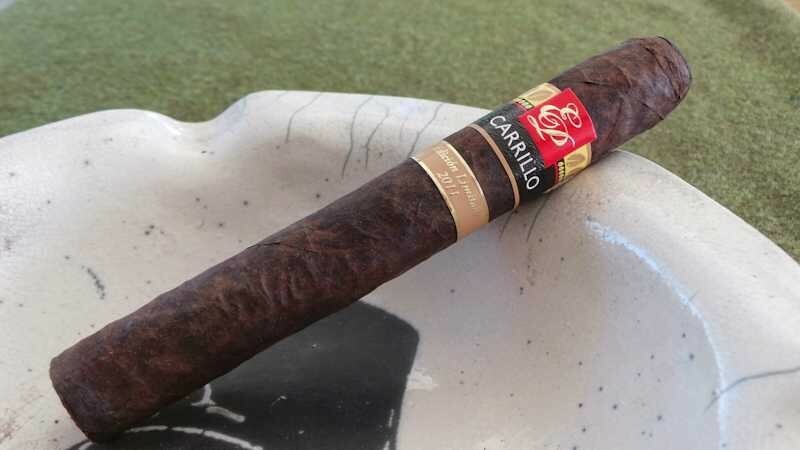 The Ernesto Perez Carillo Edicion Limitada 2011 Dark Rituals is a black beauty that makes even Ram Jam proud. A large cigar for either Kip or me, it checks in at 6-½” x 56 by direct measurement. The wrapper is labeled as an Oscuro Maduro with no country of origin, while the binder is an ecuadorian grown Sumatran leaf. The filler is only labeled as “Nicaraguan”. The box has been in my humidor for over three years and all samples seem to have at one point been absolutely saturated with oils. The wrapper on tonight’s sample even has a few spots where it looks water damaged after the natural changes the leaf has gone through. It is nearly striking how saturated it looks to have been. The two of these cigars I’ve smoked in the past both seemed incredibly full bodied (perhaps due to an overwhelming smoke production) but without major complexity. Deep and sweet flavors accompanied by some tartness were basic descriptions of how the flavor presented itself. We’ll look forward to seeing how tonight’s samples compare. We began the show with a then-breaking story on an announcement from Michael Huff that effective immediately he was leaving Dante Cigars. Per his announcement, “It’s with a heavy heart that I inform you that as of 8:30pm today EST I am no longer partnered with Mohammad Fakhro and M Tobacos INC. Any questions about Dante Cigars, accounts, orders, and special appearances please call Mr. Fakhro at [….]. Thank you all for the great ride with Dante, but no worries I’ll be back to the industry soon with crazier creations” This was an unexpected turn of events, especially in light of the fact that we had recently on bringing Michael onto the show to talk about Dante’s upcoming Purple Mofo cigar. No news as of yet on the future of that cigar. Fred Rewey of Nomad has been trickling out details about his new Nomad Esteli Lot 8613 for a few weeks now. It is finally nearing released and should be shipping this Monday. He hasn’t given blend specifics, although it is another production out of AJ Fernandez’ operation. It will come in five vitolas (Robusto (5 x 50, $8.50), Coronita (5 1/2 x 46, $8.50), Toro (6 x 50, $8.75), Grand Toro (6 x 58, $8.95) and Churchill (7 x 48, $8.95), and in boxes of 21. I know we have a number of Canadian listeners, so I thought I’d pass along that Alec Bradley is putting out a Canadian exclusive size in the Black Market line – called the Chunk. Presumably it carries the same blend as the rest of the line (Nicaragua over Sumatran around Honduran/Panamanian) but in a stubby little 4.25” x 60 vitola. Another week, another limited cigar from Crowned Heads. THIS TWEET related a few details about a new event-only cigar from the company called Snake Oil. It will be a 5.5” x 48 “Super Corona.” Halfwheel has reported a few more details – namely that it’s another My Father-produced stick and that it will carry an Ecuadoran Habano wrapper over Nicaraguan binder and filler. Initial run is 6,000 cigars, but the line will be ongoing (but event-only). Per a press release sent out this past week, Asylum is adding the 8”x80 & Super 11/18 (8” x 60/70/60) to the existing Asylum 13, 13 Corojo and Ogre lines. The former two lines will carry the sizes at $8 per 11/18 and $10 for the 8×80…while the Ogre line will be $1 more each respectively. They are now availalbe in trays, and boxes will be forthcoming in May. Cigar Hustler (in Deltona, FL – between Orlando & Daytona) has an upcoming line to be manufactured by the Nica Sueño factory (of RoMa Craft fame). The Powstanie (Po-stahn-Ya) will be available at their shop, and will also be brought to market at a limited number of other retailers around the nation. Several pictures have made their way out this week, mostly via Instagram for the shop and Skip Martin. The line will feature two blends, one for each of the co-owner brothers (Mike & Greg Sczcepankiewicz). The two worked with RoMa Craft to develop some samples and had their customer base smoke them and help in selecting the final blend (a la Cuenca 5). Mike’s blend – the Powstanie Habano – will be out in May, and features Ecuadoran Habano wrapper over Indonesian binder and Nicaraguan/Dominican fillers. Greg’s, the Maduro, will be shipping in August, and will carry broadleaf maduro wrapper over Indonesian binder and Nicaraguan fillers. Initially, a 5.25” x 54 belicoso and 6×52 toro will be the only vitolas, with possibility for more in time. Pricing is expected to be between $9-11 per stick in boxes of 21. Punch Super Robusto E.R. Asia Pacifico 2008 – Wonderful soft “Punch” flavors with a terrific burn. Smoking time for this Canonazo was quick, at about 90 minutes, but the flavors were all there. This cigar seems to be at its peak (only 7 years old!). If I had to guess, it seemed almost hollow; as if there wasn’t anything behind what was being tasted. Remember me talking about cigars that allude to so much more flavor that isn’t being released yet? Well, this cigar was just the opposite. I swear it was nearly like a victory lap from a retiring legend. TL Johnson Legend Reserve 63 – A beautiful robusto-ish sized cigar with the trademarked Luis Sanchez extreme box press. This cigar is not one to be trifled with. It is strong and flavorful, full and lasting. I find it to be at the edge of my (albeit wimpy) wheelhouse, forcing me to expand my horizons. I can dig it. JDH SIngle Action and the Ashton VSG Tres Mystique – tune in for my thoughts here! Next episode (110) we will be featuring Unbanded 022, furnished by Stephen D. So come by Half Ashed Friday night at 9:30pm EST and hang out with us in the chatroom during the show. If you would like to contact us in the meantime, you can reach us via the Contact Page or the following emails: [email protected] or [email protected] Please feel free to drop us a line if you have any questions you’d like answered, comments to make…or even compliments and complaints. We love to get your emails! Also, remember you can always go back and listen to previous episodes, which can be found in the Half Ashed Archive. You can download this week’s audio directly below (right-click “Download” and save), find us on iTunes, or subscribe with any podcast app at our RSS Feed. Video, as always, will be available at the Half Ashed YouTube Channel. October 23, 2013 (Santiago de los Caballeros, Dominican Republic) – 2013 will be hailed as the year it all started for Luis Sánchez, owner of Tabacalera LTC SRL, Terry Johnson, owner of T.L. Johnson Cigar Company and Juan Francisco “Pancho” Reinoso former agronomist for Philip Morris International with the announcement of their new Dominican farming operations and leaf company, Compañia de Siembra Hojas de Tradicion. The company’s immediate focus will be growing tobacco for combined in-house cigar production (Tabacalera LTC SRL) along with leaf production for sale. A leaf processing facility and brokerage firm is in the plans for 2014. Planting has begun, with the first crop of Criollo98 for the spring 2014 season and expansion plans are in the works for mid-2014 season growing of Dominican filler, binder and wrapper leaf. Company agronomist Juan “Pancho” Reinoso brings on board 33 years of experience from Phillip Morris and will oversee daily farming operations. “We are pleased to have on board such an experienced partner, who is so greatly respected within the Dominican tobacco growers’ community”, said both Sánchez and Johnson. Luis Sánchez plans to divide his time between US and Dominican Republic on a monthly basis to oversee the farming operations and to develop the processing facilities. Sánchez also plans to devote time to the expansion of Tabacalera LTC and its partnership with Cia. de Siembra Hojas de Tradicion. Sánchez brings 20 years in the cigar manufacturing industry (La Tradicion Cubana Cigars). Terry Johnson will remain at the helm of the marketing /sales department of the cigar distribution company for the remainder of 2013 and thru 2014 with plans to work on developing relationships with International cigar manufacturers for the leaf company (Cia. de Siembra Hojas de Tradicion). Johnson has an extensive background in farming and ranching operations and will join the team on a quarterly basis in the Dominican Republic as a consultant for the farming operations. Welcome back for another fun-filled, exciting episode of Half Ashed. This week, we take a look at the 2002 Ramon Allones Petit Corona – one of Craig’s very favorite cigars. He says, “Since its discontinuation in 2002 the PC has remained a “special” cigar in my humidor. Its big brother the corona is viewed as one of the most saught after regular production cigars since the mid 90s. Both being made in small numbers, thus always maintaining the quality, both of these cigars are great. The PC is legendary.” Tune in to the show to get both our full thoughts on this episode’s examples. Oliva is making a machine-made cigar, to be released in various markets during the coming months. As first mentioned last week on Half Ashed when we hosted Terry Johnson of TL Johnson Cigars, the news is out that he is moving some of his operations to Miami – and is partnering with Luis Sanchez of La Tradicion Cubana for a joint venture cigar brand. Dona Flor has announced a special Limited Edition IPCPR release, as well as the fact that the Alonso Menendez line is now available in the US. Yet another 7”X70, this time from Drew Estate. They’re adding this to the MUWAT line, per Halfwheel. Xikar has divested itself of its HC & Defiance Cigar brands….selling them to CI effective July 1. CI has agreed to current price protections to existing retailers through September 30th. IPCPR starts a week from Saturday. We’ll be doing….something….during the show, depending on internet connections, travel times, etc. Well wishes and quick healing to Charlie Rutherford of Boveda, who had a terrible motorcycle accident last week. I know the guys behind Boveda personally, and all are good people. Finally, we held our giveaway for June’s prize packs of Michael Stewart’s home-blended, home-rolled cigars. Michael Thomas and Steve Dorau were selected by random.org, and will be receiving those prizes. Congrats, gentlemen! We covered a good bit more during the show – various topics of interest this week, what we’ve been smoking, etc. Tune in to get the entire story on those items as well. Be sure you all come back next week for Episode 023, when we will be attempting to put a show together while Kip is in Vegas for IPCPR. We will be featuring the upcoming Ezra Zion Eminence as our Cigar of the Week. That show will likely be recorded outside our normal Friday night timeframe due to travel/show scheduling. I will tweet/post the exact time and date once we finalize it. In the meantime, if you would like to contact us, you can reach us through the contact page or at the following email addresses: [email protected] or [email protected] Please feel free to drop us a line if you have any questions you’d like answered, comments to make…or even compliments and complaints! Also, remember you can always go back and listen to previous episodes, which can be found in the Half Ashed Archive. You can download this week’s audio directly below (right-click “Download” and save), or find us on iTunes to subscribe.